Sheldon Manufacturing is the sole US manufacturer of the Visu shelving system. Through this partnership, Sheldon Manufacturing provides industrial strength stainless steel shelving systems that are sturdy and easy to install. Our shelving allows for easy modification and cleaning to meet a variety of laboratory, industrial, commercial, and home requirements. The patented Visu shelving system relies on an innovative Finnish design that maximizes load capacity while providing the highest level of user-friendliness. 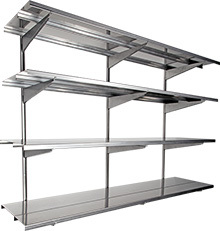 Stainless-steel construction and easy installation make the Visu shelving system ideally suited to a variety of laboratory and research facilities.